We are living in momentous times. In 1998 Topic issued the twenty CD set The Voice of the People which contains almost 500 tracks of outstanding songs and music. In America Rounder Records are in the middle of issuing a planned hundred or so CDs of the Alan Lomax collection. The Frank and Anne Warner collection of recordings has just been issued on two CDs, whilst, back in Britain and Ireland, we are seeing numerous solo albums appearing almost weekly. Elizabeth Cronin, Joe Heaney, Walter Pardon, Sheila Stewart, Sam Larner, George Townsend, Pop Maynard - unbelievable! Topic, Veteran Tapes and Musical Traditions seem to be currently working at fever pitch. And now, the long-awaited Harry Cox set from Topic has finally surfaced - long looked for, come at last, as the song would have it - beautifully packaged with extensive notes by Paul Marsh, Reg Hall, Chris Heppa and Steve Roud; and with a cover photograph by Brian Shuel, stunningly hand-tinted by John Haxby of Art Surgery. Many claims have been made about Harry Cox. He was, according to Paul Marsh, the most important and finest amongst the great English traditional singers whose songs were collected during the 20th century, and Peter Coleman has said "There were other singers, but Harry stood like a Colossus above them all." Terms such as most important and finest - let alone Colossus - are, of course, subjective and care should be taken when using such language. Many will no doubt agree that Harry was all of these things. Some, myself included, will continue to query precisely what these terms mean in the total context of English folkmusic. One fact, which cannot be disputed, is that Harry Cox was visited by folksong collectors over a greater period of time than just about any other single English folksinger. Only the Copper Family can probably stand alongside him in this respect, but here, of course, we are talking about several generations of singers and not just one man. Songs collected from Harry by E J Moeran were published in the Folk-Song Journal in 1922. In 1934 he was invited to London to record The Bold Fisherman and The Pretty Ploughboy for the EFDSS. These sides have now been reissued on volumes 1 and 2 of The Voice of the People, as have two recordings made of Harry in 1945 by the BBC, Just As the Tide Was Flowing and The Bold Princess Royal, which are available on volume 12 of the series. 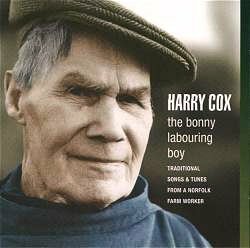 Topic's new double CD, Harry Cox: The Bonny Labouring Boy, includes one further BBC recording - The Good Luck Ship - that was made at the same 1945 BBC session, together with three other BBC recordings, also made at The Windmill pub in Sutton, this time in 1947. These are Barton Broad Ditty, Coming Home from the Wake and The Bonny Bunch of Roses, and, like all the songs mentioned so far, they really do show just what Harry must have been like at his peak. The remainder of the two CDs comprise five songs recorded by Ewan MacColl in 1955. Ten songs and one fiddle tune recorded by Mervyn Plunkett during the period 1958/'60. A half-dozen fiddle and melodeon tunes recorded in 1960 by Frank Purslow. A song and some interviews recorded by Charles Parker in 1963, as well as a further nine songs that Parker recorded with Ewan MacColl in the mid 60s. Ten songs recorded about the same time by Leslie Shepard, three songs recorded in 1967 by either Sheila Park or Cliff Godbold, and, finally, a song and three tunes recorded in 1970 by either Tony Singleton or Bob Thomson and Michael Grosvenor Myers. Occasionally, the sound quality of the later recordings is of a lower standard and some tracks, especially those made by Mervyn Plunkett, are, at times, difficult to listen to. A great pity, really, because Mervyn was responsible for recording many of Harry's rarest songs which other collectors missed. When we remember that two further songs recorded by Mervyn Plunkett are available on volumes 12 and 17 of The Voice of the People series (Come All You Men Throughout the Nation, more usually titled The Captain's Apprentice - and am I the only person to find Reg Hall's idiosyncratic titling annoying? - and In Worcester City). That there is a version of Young Edmund, also on volume 17, which, despite what the booklet notes say, was probably recorded by Parker and MacColl in the mid '60s. That there are seven tracks of Harry's melodeon and fiddle tunes on John Howson's Melodeon Players from East Anglia (Veteran Tapes VTVS 05/06), and that many of the Peter Kennedy/Alan Lomax recordings of Harry are available on a number of Rounder CDs - four songs on Songs of Seduction (Rounder 1778), three on volume 1 of the Classic Ballads (Rounder 1776), as well as the solo album, What Will Become of England? (Rounder 1839) - then we can begin to see that there really is a large amount of Harry Cox material available at the moment. Interestingly, there is very little overlap within this material. Only one track on The Bonny Labouring Boy is available elsewhere; Leslie Shepard's recording of The Maid of Australia is also, surprisingly, to be found on Topic's own CD Hidden English (TSCD 600). Some songs, such as Jack Tar on Shore and Firelock Style (both recorded in 1953 by Peter Kennedy and two years later by Ewan MacColl) show great textual similarity. Whereas, on Barton Broad Ballad/Ditty, recorded by the BBC in 1947 and Peter Kennedy in 1953 we find Harry singing an extra couple of verses on the later recording. The same thing also happens on The Turkish Lady, where Peter Kennedy's 1953 recording has only three verses compared to the ten verses recorded ten years later by Charles Parker and Ewan MacColl. Mind you, this may of course be just another example of Peter Kennedy's unacknowledged pieces of editing. At least he has admitted to editing his recordings of Georgie and The Gypsy Laddie, both of which are shorter than the versions given on The Bonny Labouring Boy. Oh no, they aren't all. I got them off people round about. Yes, I used to learn em off people singing them in pubs. Well the songs. I learnt them anywhere. Off different people. I started learning songs when I was about eleven or twelve. Pickin' up pieces. And I kept going on till I got so I knew 'em. According to Paul Marsh, in his excellent introductory essay, This was no 'old boy' trying to recall long forgotten songs heard in his youth. Harry had set out to learn songs and kept them alive in his mind by constantly singing them. Importantly, it was only when Harry reached the age of 41 (in 1927) that he married. His long period as a bachelor had allowed him to freely wander from pub to pub, singing and seeking out the company of other singers. In a way, this reminds me of something that Walter Pardon once told me, namely that being unmarried had meant that he had more time to spent with his uncle Billy, from whom he learnt so many of his songs. So, what of Harry's repertoire? As I said above, just about all of Harry's songs were printed on broadsides at one time or another. Some songs were printed repeatedly on numerous sheets, whilst others were only printed occasionally. About a quarter of the songs heard here are either unique to Harry (The Good Luck Ship and Firelock Stile) or else were seldom heard being sung by traditional singers in the middle of the 20th century. These include, The Rigs of the Times, The Green Bed, A Week's Matrimony, Georgie, Betsy, Barton Broad Ditty, The Turkish Lady and Bold Archer. I am rather surprised that Steve Roud fails to mention any English broadsides for this latter song ( a version of the rare ballad Archie o' Cawfield - Child 188). It was certainly printed at the beginning of the 19th century by Pitts and Jennings - under the title The Bold Prisoner - and the latter's text is included in volume 2 of Later English Broadside Ballads by John Holloway and Joan Black (1979) p.157 - although it should be noted that Harry's text contains a number of verses that do not appear on these two broadsides. Interestingly, Harry's tune for Bold Archer bears more than a passing resemblance to a tune often associated with the song The Spotted Cow, which Harry also sang. Other songs are also sung to tunes linked to other songs. Three lines (out of four) of The Good Luck Ship are sung to the tune that Harry used for Betsy. The Turkish Lady is sung to the tune usually found with Come Write Me Down Ye Powers Above and the tune for Coming Home from the Wake has done service in the past for versions of The Golden Vanity. The short They Told Me in the Gaol has a textual format akin to the Jack Hall/Aikendrum family of songs, although Harry's tune is not the one normally associated with these songs. About twenty songs (almost half the songs on the CDs) are sung to tunes that are usually associated with these songs. In each of these cases Harry's texts are extremely complete. At one time, songs such as The Female Drummer, Two Jolly Butchers, The Maid of Australia, Miss Doxy (Walter Pardon's Bright Golden Store), The Bonny Labouring Boy, The Fowler, Ekefield Town, Jack Tar Ashore, The Bold Drover, The Grand Hotel (usually called Down By the River Side or The Lily-White Hand), Adieu to Old England and The Bonny Bunch of Roses were, I suggest, extremely widely-known over a large area of England, their very popularity fixing their tunes in the collective memory. We are told that one of these songs, The Bonny Labouring Boy, was brought to Catfield by a visiting Irish labourer and, again, I am reminded of Walter Pardon who believed that many of his songs had been brought to Norfolk by visiting Irishmen. Four of the remaining songs - Bound to Be a Row, I Had an Old Hoss, Alone, Alone in London and Where the Shamrock Grows - are either from the Music Halls or from the Minstrel Shows, and it's a joy to hear Harry laughing his way through There's Bound to Be a Row, a song which he clearly enjoyed singing. The same may be said of The Happy Family where, again, Harry can be heard enjoying the humour of the song. Most of Harry's songs tell stories. These songs are often long and Harry treated them with quiet dignity, letting the story slowly unfold in the singing. According to Paul Marsh, Harry felt it was important for a song to have a meaning and believed that the song should speak for itself. Gestures and expressions, or "fancies" as he called them, whilst singing were unnecessary. But, Harry clearly enjoyed singing humourous songs. So why are there so few recordings of these? Have these been overlooked by the collectors? Or did Harry, in fact, have few such songs in his head? A final half-dozen songs - The Green Mossy Banks of the Lee, The Watercress Girl, Blackberry Fold, The Lost Lady Found, Coming Home from the Wake and The Poor Smuggler's Boy - are, I feel, slightly problematical, as regards their tunes. (And, I am saying this because the song notes seem to pay little regard to Harry's tunes). When I recorded Johnny Doughty singing The Watercress Girl I checked other collected sets and, as expected, found that they all seemed to share a common tune. The song is not that old and was probably quickly spread around the country via the Music Halls. But, Harry's tune is different. True, at times it is just about possible to make out the odd musical phrase that is common to the standard tune. But, as I say, it is, basically, different. And the same goes for the other songs that I have listed above in this final half-dozen. They all seem, to my ears at least, to share some musical qualities that somehow link them all together. Was this, I wonder, something from Harry himself? Or did the other Sutton singers have a pool of musical ideas - conscious or unconscious - which transformed tunes into a form that was popular with the singers? Some of Harry's other songs, which are not included on these CDs, also seem to belong to this group. I would dearly love to know what others think about this and, hopefully, somebody with a better grasp of melody than myself may, one day, come up with some answers. So, how should we regard Harry Cox today? Harry was one of a group of singers from the area around Catfield. Only a handful of recordings exist from some of these other singers, and so we are unable, really, to place Harry fully in context. We just don't know how all the other singers sang. Harry was very good at using subtle melodic ornamentation at key points of his songs. Was this something unique to Harry, or can the same be said of the other singers? I have already queried the fact that Harry's known repertoire - certainly his recorded repertoire - is heavily biased towards folksongs . Clearly, Harry and his companions did sing a lot of these type of songs. But, did they sing anything else, any other types of songs? Have collectors, over the years, stressed the importance of folksongs to Harry, so that he came to feel that these were the songs that he should sing to his transient visitors? Perhaps we should ask Leslie Shepard if the ten songs that he recorded were offered, unprompted, by Harry. Or did Harry sing other items that have been left off the CDs? If this is the case, then who made the choice of just what material should, and should not, have been included? So, can we truly say that we can fully understand Harry's importance? Somehow, I don't quite think that we can. Judging by his recordings he was a wonderful singer with a large and fascinating repertoire. Some of his songs - and probably not as many as some people have suggested - entered the repertoires of revival singers. One song, The Black Velvet Band, even entered the top-twenty. But, I do not think that we can say that he was a better or more important singer than, say, Sam Larner or Walter Pardon. In their own ways, all folksingers are important. Having said all of the above, I must stress that Harry Cox: The Bonny Labouring Boy is a highly important issue for the folk-world. Indeed, it may well turn out to be one of the most important sets ever to have been issued. Peter Coleman's comment about Harry being "like a Colossus above them all", is, of course, a misquote from Shakespeare. It continues with the line concerning, lesser men, scurrying about to seek dishonourable graves. Paul Marsh, Reg Hall, Steve Roud, Chris Heppa and all the people mentioned in the CD's acknowledgments should be extremely pleased that all their efforts have, finally, born fruit; and, unlike those lesser men , should be only too happy to hold their heads up high. No dishonourable graves for them!